she could do in them. It was a positive way of helping her accept the changes in her life, focusing not on what was missed, but on the abundance of good times — and love — that she would continue to share with her mom and dad." Kady MacDonald Denton is the illustrator of A CHILD'S TREASURY OF NURSERY RHYMES and two books by Margaret Park Bridges - IF I WERE YOUR FATHER and IF I WERE YOUR MOTHER. 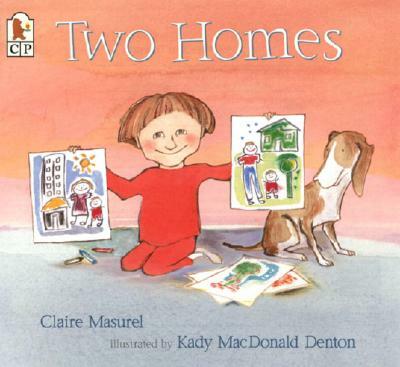 TWO HOMES is her first book for Candlewick Press. She says, "Alex talks about simple things like toothbrushes, bedrooms, and friends — and they are all special because they are part of the love Alex feels in both homes. I tried to show that love in the illustrations." Enhanced by Denton's sensitively drawn portrayals of the characters within well-imagined scenes of domestic life, this picture book will validate the experience of other two-household children, while intriguing those single-home families. Simple, yet profoundly satisfying. The ink, watercolor, and gouache illustrations are comforting and warm....This book is clearly intended to help parents tell their children that they are still loved despite their living arrangements. On page after page, Alex and his parents engage in the pleasant common activities of early childhood, from playing dress-up with an assortment of friends, taking a bath, and shucking peas at Dad's, to baking gingerbread men at Mom's. An extremely positive take on an often painful subject.